Kitchen remodels | The kitchen is the core of your home’s value. 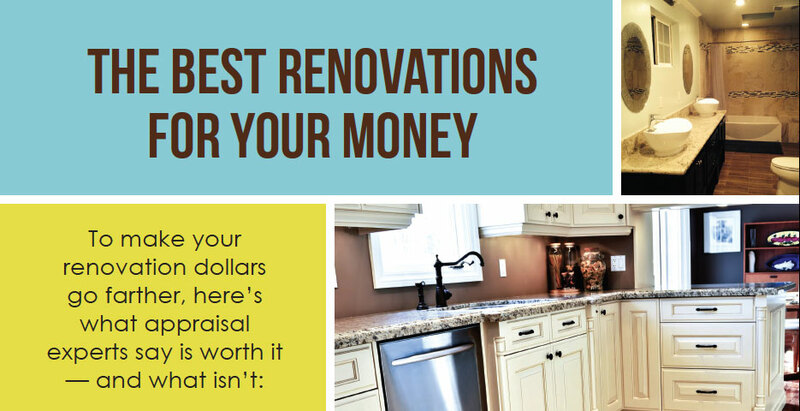 Investing in upgrades to appliances, surfaces, storage, finish, and details can give the whole home a new feel. Take the extra step to create an open floor plan for maximum return. Bathroom upgrade | Freshen up fixtures, tile, and lighting to transform a dingy, dated bathroom and impress potential buyers. The less they feel they’ll have to do themselves, the more your home is worth. Energy efficiency | Green is the color this season — in more ways than one. Upgrading your home to energy-efficient lighting, insulation, windows, and appliances appeal to buyers’ senses of civic duty, and to their pocketbooks in terms of long-term savings. Forget the fancy office | Showcasing your home’s flexibility is a smart move, but beware the permanent conversion with expensive built-ins. Buyers won’t relish the thought of un-renovating that deluxe office or yoga studio.